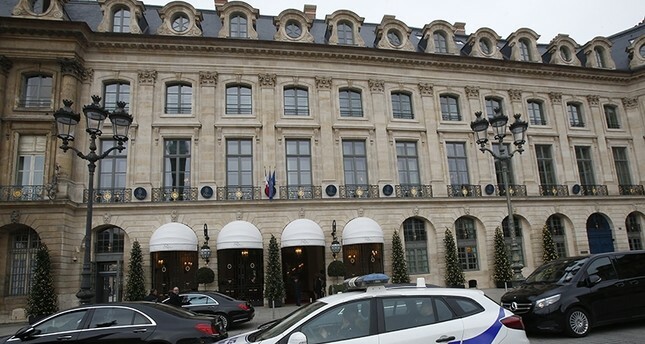 Paris police have recovered some jewels stolen from the Ritz Hotel in a dramatic heist, but are still searching Thursday for two thieves and the rest of the missing luxury merchandise. The robbery on Wednesday evening raised questions about security in one of the world's most prestigious neighborhoods, the Place Vendome, whose well-guarded buildings include the Justice Ministry, high-end boutiques and the 19th century Ritz. Workers cleaned up shattered glass Thursday morning and started to repair damage from the robbery. Otherwise business appeared to be returning to normal at the Ritz, with no significant increase in security. Three suspects entered the hotel through an unmarked side door, smashed display cases and threw bags of goods out a window to at least two accomplices outside, according to a police official. The three inside were then blocked when they tried to flee through another door, and soon arrested, the official said. The accomplices outside fled, one on a motorcycle and another in a car. The motorcyclist dropped a bag with jewels and hatchets when his motorcycle hit a pedestrian during his escape, the official said. The pedestrian was lightly injured, said the official, who was not authorized to speak publicly about an ongoing investigation. Other jewels were found scattered amid the debris of the shattered display cases during overnight cleanup efforts, the official told The Associated Press. The overall value of the jewels on display was about 4.5 million euros ($5.4 million), and authorities were working Thursday with the jewelers to determine how many items are still missing and their value, the official said. Another police official said some of the thieves apparently had guns. Two people inside the hotel hid from the thieves and alerted police, the official said. Patrons at the hotel's renowned Hemingway Bar described panic as the thieves entered the hushed environment of the Ritz, where rooms start at 1,000 euros ($1,200) a night. Several high-end Paris jewelry stores have been targets of dramatic robberies in recent years, including Cartier, Harry Winston and Chopard. Kim Kardashian West said she lost millions of dollars' worth of jewelry when she was robbed at gunpoint in a Paris apartment in October 2016. The Ritz was an especially luxurious target. The hotel has housed such famous names as Ernest Hemingway and Coco Chanel. It was the last place Princess Diana stayed before her fatal car crash in a Paris tunnel, and hosts elite guests from around the world who prize the refined neighborhood.